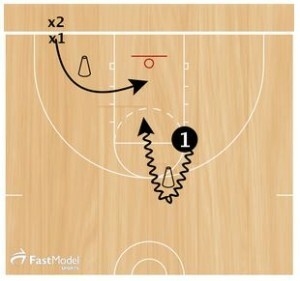 I found these 2 drills in the Fast Model basketball library. 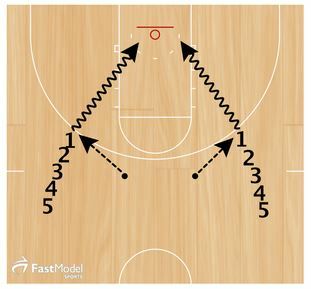 If you like these drills, please consider sharing them on Twitter or Facebook through the share buttons on the left side of the page. Also, there are links to other drills at the end of the post. This drill was contributed by Taylor Jannsen. He is the owner and founder of PMax Basketball Training centrally based out of Milwaukee. The purpose of this drill is to teach players how to beat rotational help with a variety of finishes. On the offensive player’s first move, the defense loops around a cone and simulates a help defender. Player 1 pushes the dribble out in front and must touch the paint before attempting a shot. Make the drill competitive by scoring it as a one on one game. You can either play straight scoring or allow the offense to stay until the defense gets a stop. This drill allows for a lot of repetitions on moves for finishing around the basket, one on one moves, and jump shots. This can also be used by small groups or individuals as a part of their improvement season workouts. Passers are represented by dots. If there are no passers available, players can simulate a pass by spinning the ball to themselves. This series of moves is to be executed twice at each wing, once going to the open side and another time going to the middle. To make it competitive, time one player through all 6 moves from one spot with a 2 second penalty for each missed shot.